﻿ Food reviews featuring restaurants and stores visited by AboutBlackBoston Online users and staff. Boston Black-owned restaurants and establishments owned and operated by Africans, Caribbeans, Haitians, Jamaicans and black ethnics serve to satisfy the palettes of everyone. There is a lot of turnover in the restaurant industry. One year after the Boston Black Restaurant Challenge List was published, let's see who will be around when February 2019 comes. All of them, we hope! The photo shows a corner off of Washington Street Dorchester, near Codman Square. On that block are different brands of Jamaican and Caribbean restaurants. Speaking from personal experiences, the Jamaican restaurant Ali's on Blue Hill Ave and Talbot makes a great ROTI sandwich. I think they have a South End location as well. I don't eat hamburger or steak and prefer as little chicken as possible. My diet prejudice limits access to food many listed restaurants serve. I'll tell you what I've heard people say about them on this page. 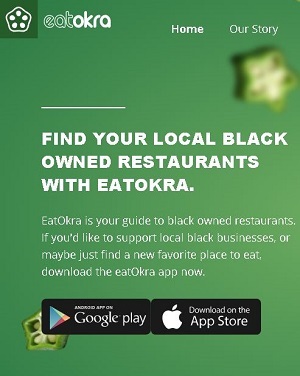 Easy to use Eat Okara app for smartphones helps you find over 800 Black-owned restaurants and eateries listed in the U.S., the Caribbean and South America. The Boston area is represented with beatiful photos and menues from restaurants. BRED, the sandwich shop in Lower Mills makes great hamburgers. This woman said she drives eighteen miles one say just to buy from them. Slades Bar and Grill gives you a lot on your plate and its tasty good. SUYA JOINT in Dudley Square get's its share of the market. My plate was fine, one has to acquire a taste for suya style cooking but its a bet you should try. DUDLEY CAFE & COFFE SHOP right there in Dudley Square is a socially active hangout/project/poetic space. A block away. HALEY HOUSE BAKER AND CAFE is all that plus art gallery, ex-prisoner training facility, coffee roaster, catering company, Vegan and Vegetarian Restaurant and more. These cafes are owned by progressives - you know what I mean. 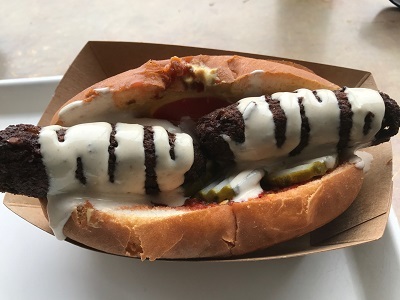 The dish features falafel links added to the middle of a tasty hot dog bun. A strip of flavored sauce tinted to a light, lemony tahani is dripped on top. There are other flavors in the sandwich made by chef magic but I couldn't identify them all. I added a dash of red hot sauce and put moist, softened shitake mushrooms on the side. This sandwich is highly recommended. Served at Whole Heart vegan restauran in Allston. 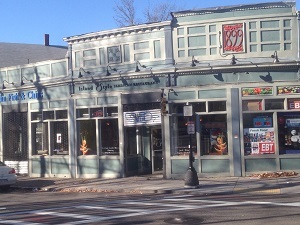 The Coast Cafe is just across the river from Boston in Cambridge's Cambridgeport neighborhood. A co-workers knows the owner. He took me there once and the food was good. I've been back on my own since then. My friend told me it is not unusualy for the Boston Celtic basketball team to pull over to Coast Cafe in a bus and stock up for road trips. Hummm... I have never seen a "Boston Celtics Bus" so it must not be green or I am sure I would have seen it by now. This small take out oriented restaurant was picked by the Travel Noire site for their Best Soul Food Restaurant in Massachusetts list. ASHUR was behind Roxbury Community College when I dropped by for a take out. Its a cool place. I only got a coffee to go but I liked what was on the menu.FORT HILL BAR AND GRILL is getting rave reviews from people I know who go there every time they leave church on Sunday. They attend Bethel A.M.E in Jamaica Plain and the fort hill community is not that far way. Boston Restaurant Challenge highlights 35 Black and minority owned restaurants in Boston. This convenient list of Black and Minority-owned restaurants around Boston made headline news early this year. Justin Springer and a State Representative collaborated to produce and promote it. Ethnic and major media covered it when it was released. LiteWork Events, a popular social events organization of urban professionals reviewed locations on the list. 867 Bolyston Street, 5th Fl.